Nauru is the smallest independent republic in the world, and it is located in the South Pacific Ocean, south of the Marshall Islands. It is a small piece of tropical paradise where you can get some peace and quiet. It is ideal for a vacation if all you want to do is rest. It is not that you would not have activities, but Nauru is more suitable for easy-going people. You can take walks around the island if you want. There is a road that goes in a circle so that you can explore it all in one circuit. By foot, it takes about 6 hours to complete. But you can rent a bike. Swimming is available, but not on all beaches. That is because most of them are shallow and rocky. For a swim, go to Anibore Harbour. Before traveling to Nauru, you need to make inquiries about what kind of visa you need. That is because everyone needs a visa to visit Nauru, but 15 nationalities are eligible for a free visa on arrival. At the same time, 66 nationalities are eligible for a simplified visa application process. It means that unlike other travelers who do not qualify for a free visa on arrival, they are not required to submit a criminal record and a health certificate along with the visa application. Lastly, all the other nationalities must apply for a consular visa. One thing that is worth mentioning is that all travelers who must apply for a Nauru visa do not have to go to an embassy. Instead, the visa applications are sent by email to the Nauru Immigration with all the necessary documentation. 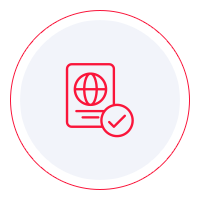 If you want to learn which type of visa application process applies to you, we recommend that you use iVisa’s Visa Checker. Click on the button that says Visa Checker. You can see it in the top right corner. Then, you must select your country of origin in the drag-down box on the left and Nauru in the right box. The result will display whether or not you need a visa. And if you do, you will receive some useful information. iVisa does not process Nauru visa applications at the moment because electronic visas are not available. We would like, however, to help in any way that we are able. That is why our support service is at your disposal 24/7, and it is free of charge. If you find out that you are not eligible for a free visa on arrival, you must inquire about the requirements. You can find a lot of valuable information online, but not all of it is reliable. You should use it as a reference only. The Nauru Immigration Office will always be the most reliable source of information. You should contact them before you apply. In the meantime, what we can tell you is that you need a valid passport that does not expire for another 3 months from the date of arrival in Nauru. We regret that we cannot help you any further with the Nauru visa application process, but we are sure that the information above is useful.